Heavily influenced by the Abstract Expressionist movement in her formative years, she has returned to the genre and focuses primarily on non-representational paintings in acrylic. Being freed from reproducing recognizable objects, her paintings have become more intuitive and authentic. Often Templeton’s work is composed of organic shapes and strong calligraphic lines. The process and application of her medium is applied quickly using color, value, and movement to create an engaging composition. Templeton was born and raised in Minnesota and studied art at several colleges. She currently works out of her studio in downtown Fargo. 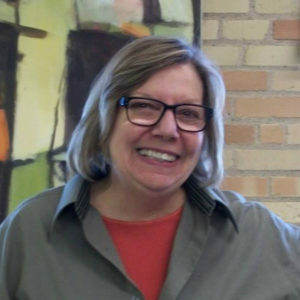 She has exhibited her work at Plains Art Museum (Big Country: FMVA Scale the Plains, Landmark: Views of the Moorhead Power Plant, and several Spring Gala auctions), the Spirit Room Gallery, Underbrush Gallery, the Jamestown (N.D.) Art Center, and several group shows in Minneapolis. Templeton is also a member of the Lake Country Pastel Society, the Pastel Society of America, and Fargo Moorhead Visual Artists.